The occupant classification system detects the front passenger seat condition and then indicates whether the front passenger airbag is activated or not through the passenger airbag on / off indicator illumination. The passenger airbag on / off indicator illumination changes depending on the front passenger seat condition as shown in the table below. Turn the ignition switch on, and check the srs warning light condition. Ok: the srs warning light does not come on. Check if the passenger airbag on / off indicator correctly indicates the front passenger seat condition. Loosen the 4 installation bolts of the front seat rh. Tighten the 4 installation bolts of the front seat rh to the specified torque (see page se-22). Check that the connectors are properly connected to the occupant classification ecu and the 4 occupant classification sensors. Ok: the connectors are connected. 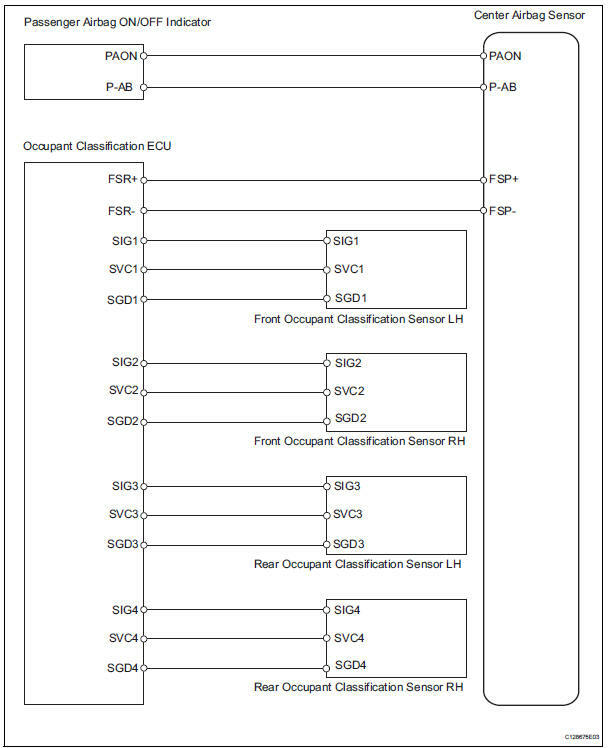 Disconnect the connectors from the occupant classification ecu and the 4 occupant classification sensors. Check that the connectors are not damaged or deformed. Ok: the connectors are normal. Connect the connectors to the occupant classification ecu and the 4 occupant classification sensors.